Chrononauts #2 is the latest issue in a series that gives Mark Millar and Sean Gordon Murphy the chance to show off their creative juices. And that issue will pay homage to a movie that's near and dear to the heart of many fans. 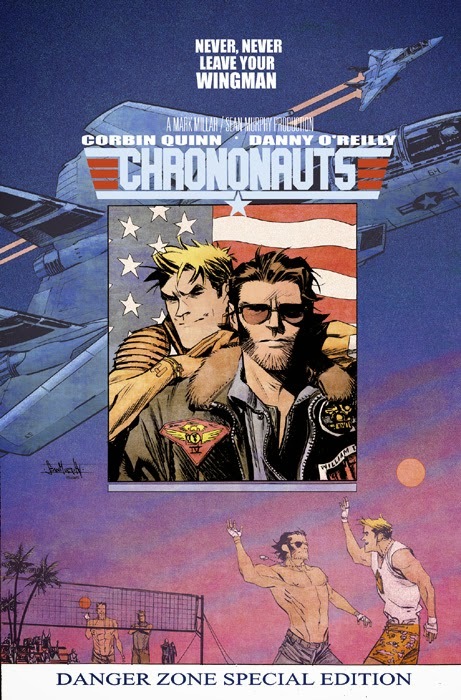 That's right--Chrononauts #2 will feature another pop culture movie poster-inspired cover, this time a Top Gun homage. Readers with the need for speed can pick up CHRONONAUTS #2 when it hits stores this week. Chrononauts #2 is available now and Cover A by Murphy can be ordered with Diamond Code FEB150598. The Top Gun-inspired Cover B by Murphy can be ordered with Diamond Code FEB158100. Chrononauts #3 will be available on May 13 and can be pre-ordered with Diamond Code MAR150558. Cover B, another homage to an iconic movie poster soon to be unveiled, can be pre-ordered with Diamond Code FEB158101. Full press release below.